* becoming an Auntie! Little Stella Jean at just 1.55kg and almost 10 weeks early is doing just fine! Just had to do a spot of shopping for her today ;) Parcel all set to mail tomorrow - man I wish Melbourne was alot closer! * Finn's great school report that came home on friday - "Finn is a happy and helpful boy and has been a pleasure to teach" - that's my boy! * finding a cool idea on a blog for a reindeer Christmas card made from outlines of Emma's hands and feet - used her's coz they are the smallest in the house. This card went down a treat with the Kindy teachers and then Finn came home from school today and guess what they had made - yip the same thing! * getting some cool photos taken with Santa. The NICU unit at Dunedin Hospital do this as a fundraiser each year and this is the 4th year we have supported them, a great deal for $15 you get two prints and a cd full of all the photos they take of your kids - our cd has 49 photos on it!!! * getting all my Christmas shopping done! * yeah for last day of school tomorrow, then the alarm gets turned off and we can enjoy the holidays without having to rush everywhere! cute card idea.... and great list... well done on the aunty thing!!! love those babies... as for school finishing.... tomorrow... we have 2 more days!!! love the card Mich. Stella is such a beautiful name and I bet she can not wait to be introduced to her aunty and cousins as well. Cute photo of Santa and the kids. Yum fresh raspberries and ice-cream. That's a great deal for your Santa photo ... getting a cd is good value and supporting a good cause too. Oh Mich, bet it was hard to stop buying for your new neice...those tiny little baby clothes are just so adorable. 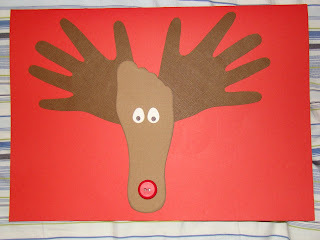 We did those reindeer as well - will take a photo and chuck on my blog - our kids used the little wobbly eyes and a pom pom for a nose - there's a few 'drunk' looking reindeer, with one eye going one way...LOL! What a great card idea Mich - love it!! I know what you mean about baby clothes, I have to stay away from that section in Pumpkin Patch according to hubby to stop me clucking lol!! Congratulations to Finn on a great report - that's a wonderful comment and I bet you are a proud Mum! I am also looking forward to not having to get up quite so early, and rush around getting ready for school & Kindy. Bliss! 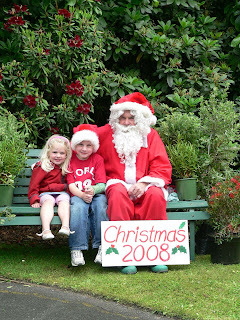 That's a gorgeous photo of your kids with Santa :-) Can see it on an upcoming layout? ?